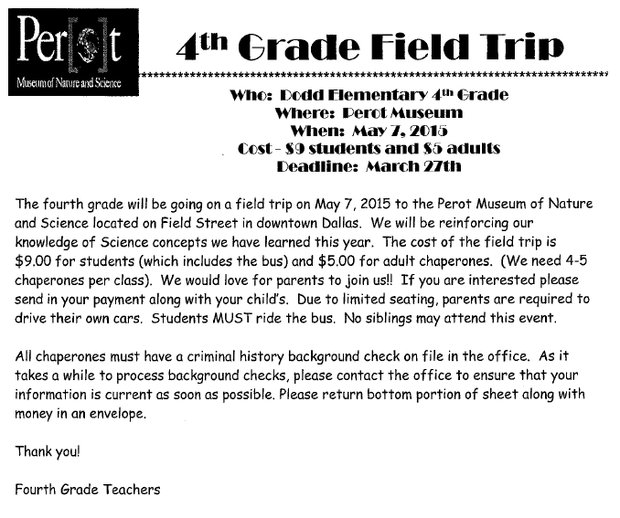 You will be receiving two different field trip forms. One is for the Perot museum and one is for the 4th Grade Track Meet. Please fill these out as soon as possible and return by the due dates. The culture and climate of a school campus is essential to the success of our students! Just like we monitor each student's performance, academically, we want to monitor how our campus is perceived by our Dino families. Please take some time to complete the district survey, linked below. Your input is greatly appreciated and will drive future decisions made at your child’s school! Each response is read by both campus and district administration. If you have any questions, please feel free to contact Ms. Duvall or Mrs. Branch.